With school bullying a major concern in America here is a wonderful lesson of a child accepting someone that is different than them. "Sign of a Friend" by Pamela Brown is a 24 page illustrated children's book. 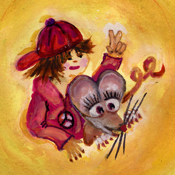 The story told by Beanie, a very cute mouse, is about Paul, a seven year old boy, who reaches out to a hearing impaired classmate. Paul can not understand why no one plays with the challenged student and with help of a sign language phrase and some popcorn befriends his classmate. The text is from a font produced by Ms. Brown's hand writing and the illustrations are done in water color. Interaction includes actual signing techniques, character bios and read-to-me/read-it-myself functions. App development, character voices and soundtrack are produced by Studio 120.